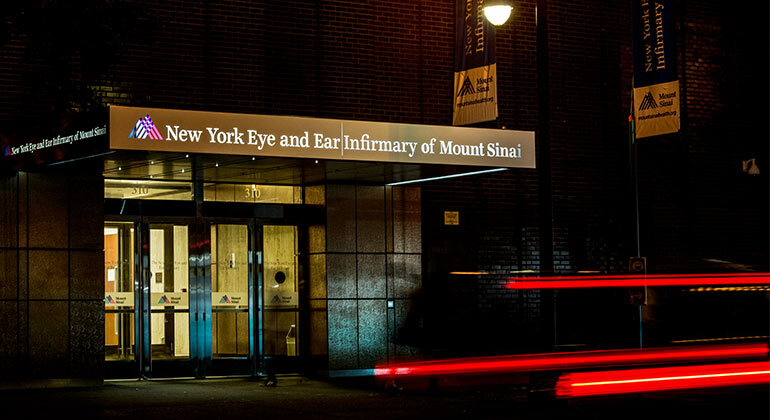 New York Eye and Ear Infirmary of Mount Sinai (NYEE) is one of the world's leading facilities for the diagnosis and treatment of diseases of the eyes, ears, nose, and throat, and related structures of the head and neck. Founded in 1820, NYEE is the first and most historic specialty hospital in the nation, as well as one of the busiest. With a rich heritage and a mission of providing the highest quality patient care, graduate and continuing medical education, scientific research, and community outreach, NYEE has built upon its strengths to maintain a leadership position in the fields of ophthalmology, otolaryngology/head and neck surgery, and plastic and reconstructive surgery. Commitment to excellence has earned NYEE a ranking as one of U.S. News & World Report's "Best Hospitals in America" for Ophthalmology and Otolaryngology, and a number of its medical staff are included in nationwide "Top Doctor" directories. The hospital has been awarded Magnet status twice for excellence in nursing care. As a specialty hospital, NYEE is uniquely qualified to handle the most complicated cases, as well as a high volume of the most commonly needed procedures, and it is well documented that excellence in clinical outcomes is strongly correlated with experience. Performing more than 30,000 surgical cases and 235,000 outpatient visits per year, NYEE is the region's most comprehensive center for the delivery of primary through tertiary eye and ear-nose-throat care. At NYEE is the New York Eye Trauma Center, a highly specialized service dedicated to repair of all aspects the eye, including oculoplastics to help assure good aesthetic outcomes. Patients are referred from the tri-state area when time is of the essence in treating the injured eye, as well as from around the world for primary and secondary repair of complex ocular injuries. NYEE's Eye Trauma Service is home to the Eye Injury Registry of the State of New York and is a member of the United States Eye Injury Registry. The dedicated medical staff comprises more than 600 board-certified attending physicians and surgeons, many renowned for breakthrough research and introducing widely-practiced techniques. NYEE is one of the nation’s leading institutions for training the next generation of ophthalmology, ear, nose, and throat specialists. With access to the latest diagnostic technology, the expertise of our nationally recognized faculty, and a diverse patient population, our trainees have the opportunity to learn the safest and least invasive therapies and the latest minimally invasive surgical techniques for common and complex conditions. NYEE serves as a national and international referral center with a commitment to teaching, research, and care based on the latest technologies. Cutting edge ocular imaging instrumentation provides the highest resolution to diagnose diseases of the cornea, retina, optic nerve, and glaucoma. Multidisciplinary teams specialize in acute and chronic ear disease, cochlear implantation, intra-cranial tumors, and facial nerve disorders In all forms of aesthetic and reconstructive surgery, microsurgical capabilities and minimal incision techniques produce a natural, youthful appearance with rapid recovery. Highly experienced staff in state-of-the-art surgical facilities have made NYEE's 19 operating rooms a benchmark of efficiency. Less invasive surgical procedures and technologies—many developed and refined in the ORs and labs of NYEE—have improved treatment success rates and shortened hospital stays in all core specialties. With comprehensive services in a convenient campus, NYEE provides high-tech treatment in a caring and friendly environment. In addition to its main hospital facility in the vibrant Union Square area, NYEE has an established and growing network of satellite offices and is developing free-standing ambulatory surgery centers in high density business districts and select residential neighborhoods. Our satellites are staffed with NYEE physicians and equipped with the latest diagnostic equipment, making access to specialty care more convenient to people where they live or work. Almost a quarter of the hospital's patients are children, so the services of eye and ear-nose-throat specialists are coordinated with support staff especially sensitive to the youngest patients and families. Approaching its milestone bicentennial in the year 2020, NYEE will continue to pursue applied clinical and basic research to further enhance patient care through scientific advancement, and improve the patient experience with ongoing modernization and expansion of programs in all clinical and diagnostic areas.